Friends and Fans of The Outcats page of old Friends' & Fans pictures and sign-into the Friends and Fans guestbook. CLICK HERE for a Tour down memory lane with The Outcasts. Pictures, in concert, the Fan Club Prex. & V.P, Friends and the infamous Teen Canteen. "I'm In Pittsburg And It's Raining"
In-depth archive of Texas Music in the 1960s. Ongoing and archived discussions, pictures, graphics, database and search engine. Mike Lowell's EXCELLENT History and Archives of Texas Bands and Music. Info and accounts contributed by the Musicians and People who were there. ...and Sally Senter and John W. Carson who managed our young piss and vinegar. First and foremost, the countless People young and old we were blessed to know as Fans. Faye Patton --- Youth activities organizer and The Outcasts first adult motivator. Duffy Lazarus --- The Outcasts first dedicated Fan. The Regulars at Faye Patton's riding club --- The Outcasts first Fans. Sharli Archer --- President, The Outcasts Fan Club. Beth Gardner --- Vice-President, The Outcasts Fan Club. Sisters Meagan, Feagon and Reagon __?__ --- Original Fan Club activists. often chauffeur, contraband / security officer and close reliable Friend. Sam Kinsey --- Teen Canteen and TeenTown owner / mgr. / promoter. Don Couser --- KONO radio and TV. Ricky Ware --- KTSA radio. Mike Post --- Musician, songwriter, movie and television music producer. Ron Newdoll --- Record producer and engineer. Huey Meaux, the Rajin Cajun ---- Record producer and engineer. "Peter Starr" --- DJ & British Pirate Radio personality. The Lady seamstress that made our first, scratchy, itchy, silver lame' show jackets. Military Special Services in Texas. Countless military and civilian venue managers. Countless Texas Musicians who all built the Texas sound legend. who paved the way down often-difficult, dusty and rocky roads. Caldwell Music store --- 1960's supporters of Music, Musicians and Bands. Buddy Carson --- Keyboard, Harmonica, Vocals, Percussion. Denny Turner --- Lead Guitar, Autoharp. Jim Carsten --- Rythm Guitar, Vocals. Jim Ryan --- Bass Guitar, Vocals. Sally Senter and second manager Col. John Carson. And to all other Outcasts' Friends and Fans who have left this world before their time. and is broadcast every time an Outcast record is STILL played. One of the very best psychedelic/punk bands to come from Texas. They were based in San Antonio. Their two best known songs were I'm In Pittsburgh (And Its Raining), a Jim Carsten composition with catchy drumming and some effective mouth organ, and 1523 Blair, the zenith of their career. This has a superb psychedelic beginning which gives way to high speed guitar work culminating in a psychedelic haze. Not surprisingly their better work is well represented on compilations:. Texas Punk 1966, Vol. 2 includes the 'A' sides to their second, third and fourth 45s. You can also hear I'm In Pittsburgh on Pebbles, Vol. 1 and Flashback, Vol. 2. Both sides of their final effort can be found on Texas Punk From The Sixties and Texas Psychedelic Punk, Vol. II for which metal acetates exist. The 'A' side was also included on Acid Dreams, The Acid Dreams Testament (CD) and Mayhem and Psychosis, Vol. 2. The flip, another stunning performance, can also be found on Endless Journey, Phase 1 or Texas Punk 1966, Vol. 2. The latter also includes Sweet Mary and The Birds by the band. A previously unreleased mix of Everyday can be found on Texas Punk (1964-68), Vol. 3 along with a previously unreleased outtake from 1966, entitled My Love and What Price Victory, a protest song about the Vietnam War. Another track featured on the comp, Hard Lovin' Babe with Linda Pierre King on vocals, is by a different Outcasts... Over 10 years on the band turned up singing I'm In Pittsburgh on the 'A' side to a 45 I Feel So Bad / Undecided (Grease FUN 2) credited to The Kicks which was supposed to be released as a new wave record in Europe! A few picture sleeve recordings did apparently get circulated. 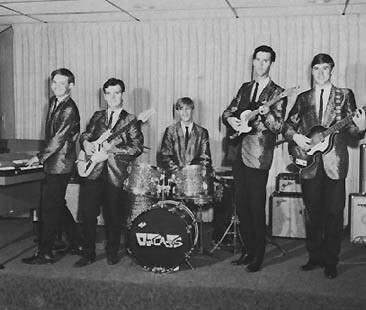 Gary Lewis and the Playboys before this and put the show together. Exposure to Mike's professional attitude and working with him in the studio was an important factor in tightening the group into a working unit that went on to bigger and better things. The CD compilation, I'm In Pittsburgh And It's Raining, contains all of their 1966-7 singles, unreleased material and later recordings when they were in Houston. "Don't forget falling freely throuh time's tunnel 'til it stops those who were"
The Outcast's 2nd business card before the 5th Outcast Jim Ryan was found. The first cards were hand made in color with ball-point permanant fabric paint ...as were their first uniform white shirts with this same The Outcasts logo large across the back and small on the front left pocket. 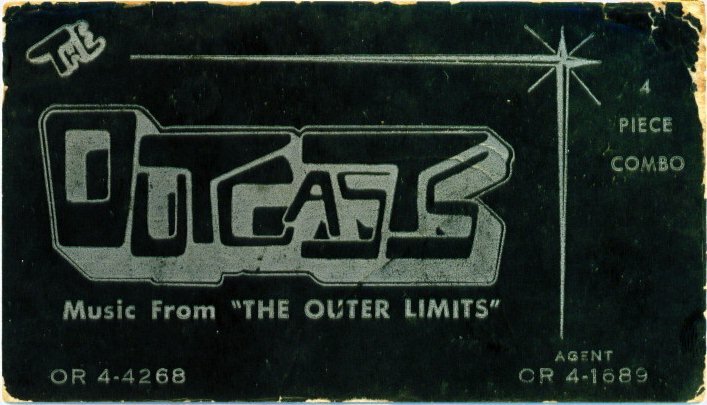 Denny designed most of The Outcasts custom promotional graphics with a style that would become psychdelic graphics some 4 years later. Archivists and local traditions attributing The Outcasts as forerunners and contributors to the advent of Psychdelia and Punk, ...was not for their more-mainstream recordings pitched and mixed by older A&R and recording professionals with less "youthful" vision, ...but was more a result of their charisma, attitudes and delivery in live performances. Industry standard for recording studios and technicians during the mid 1960's was to record amplifiers set at moderate volume clarity ...which was not the volume and sound The Outcasts produced in live performance. Today, playing their recordings through tube pre-amps near the top of the amps' headroom / gain, (while using the power amp section for desired volume) gives a much better idea of the live sound they produced. If such a sound system is not available, then a similar sound can be produced by playing the recordings through a tube guitar or bass amplifier that has channel (pre-amp) and master gain / volume.